Which natural oil do you rely on for the ultimate benefit of your skin? Is it coconut oil? Olive oil? Almond oil? Maybe you have even been using essential oils in combination with it to boost the health of your skin. But have you ever thought of using Kumkumadi oil for restoring the health and glow of your skin? This magical beauty oil is a gift from Indian Ayurveda and it has been an integral part of women’s skincare ritual since time immemorial. Be it battling against the deadly wrath of environment or repairing the damage caused by chemical-filled cosmetics, it can take away all your skin woes without ripping you off your time and money. So, here is how to use Kumkumadi oil for skin and hair and why you should stock up your cabinet with this not-so-glam oil right now. How To Prepare Kumkumadi Oil? Who Should Use Kumkumadi Oil? Kumkumadi oil or Kumkumadi Tailam is a uniquely formulated oil blend that helps the skin appear young, healthy, and flawless. Being an amalgamation of 26 to 29 highly potent Ayurvedic oils and herbs, Kumkumadi oil is considered as one of the best wholesome natural skincare solutions ever. It moisturizes and softens the skin well, improves its tone and texture, brightens up the complexion, and treats a whole lot of sin issues. ‘Kumkuma’ or ‘Saffron’ is the key ingredient of this oil and hence, it is also called ‘Saffron oil’. Some other beneficial components of the potion include sandalwood, turmeric, lotus pollen, yasad bhasma, vetiver, licorice, etc. According to Ayurveda, it is a ‘miraculous elixir’ that works in a slow and sustained manner to cleanse the entire body from inside out and heal the skin successfully. If you are looking for a way to include oil in your regular beauty regime, this traditional remedy will help you with probably everything under the sun. Lal Chandan / Red Sandalwood (Pterocarpus Santalinus) – 48 g.
Lac (Laccifer Lacca) – 48 g.
Manjistha (Rubia Cordifolia) – 48 g.
Yashtimadhu / Mulethi / Licorice (Glycyrrhiza Glabra) – 48 g.
Daruhaldi (Berberis Aristata) – 48 g.
Ushira (Vetiveria Zizanioides) – 48 g.
Padmaka (Prunus Cerasoides) – 48 g.
Nilkand / Neel Kamal / Blue Lotus (Nymphaea Stellata) – 48 g.
Vat Vriksha / Indian Banyan (Ficus Benghalensis) – 48 g.
Pakar / Java Fig (Ficus Lacor) – 48 g.
Kamal Kesar / Indian Lotus / Sacred Lotus (Nelumbo Nucifera) – 48 g.
Bael (Aegle Marmelos) – 48 g.
Agnimantha (Premna Mucronata) – 48 g.
Shyonaka (Oroxylum Indicum) – 48 g.
Gambhari (Gmelina Arborea) – 48 g.
Patala (Stereospermum Suaveolens) – 48 g.
Shalaparni (Desmodium Gangeticum) – 48 g.
Prishnaparni (Uraria Picta) – 48 g.
Gokshura (Tribulus Terrestris) – 48 g.
Brihati (Solanum Indicum) – 48 g.
Kantakari (Solanum Xanthocarpum) – 48 g.
Manjistha (Rubia Cordifolia) – 12 g.
Yashtimadhu / Mulethi / Licorice (Glycyrrhiza Glabra) – 12 g.
Mahua (Madhuca Longifolia) – 12 g.
Lac (Laccifer Lacca) – 12 g.
Pattanga (Caesalpinia Sappan) – 12 g.
Sesame Oil – 192 ml. Goat Milk – 384 ml. Kesar / Saffron pollens (Crocus Sativus) – 48 g.
Make a coarse powder of everything listed under Kwath Dravya. Soak all powdered herbs into 9.126 lt. of water. After a few hours, boil this herb-water mixture and simmer it until the quantity of the liquid is reduce to its 1/4th part. Filter the concoction (Kwath) and keep it aside. Take all herbs listed under Kalka Dravya, add a little water to them, and prepare a smooth paste (Kalka) of medium consistency. Now, pour sesame oil and goat milk into a vessel. Add ‘Kwath’ and ‘Kalka’ to it and mix everything well. Boil this mixture for some time and then, put it in simmer until only oil remains. 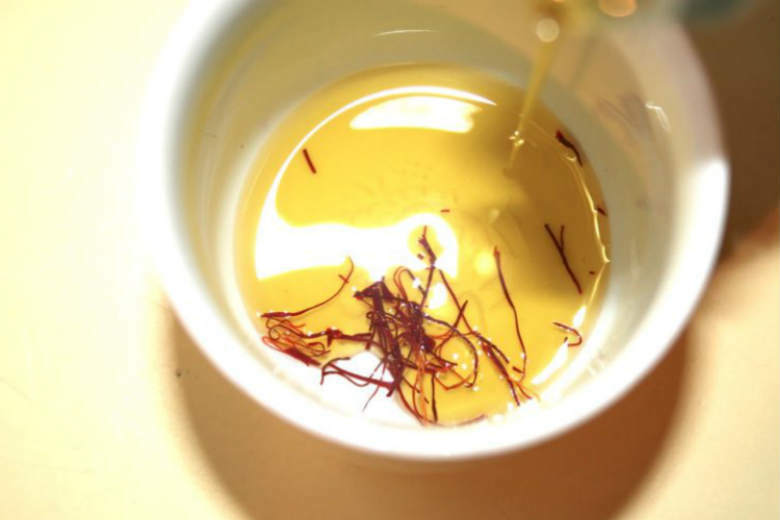 Finally, take Kesar and rose water together to prepare a paste out of them and add it to the oil. The best thing about Kumkumadi oil is that it suits all types of skin. However, it is especially beneficial for dry and problematic skin. Women with oily skin should use it carefully as overuse of this product can make them feel too greasy. A massage with Kumkumadi oil boosts the flow of blood to the cells and makes the skin look youthful and healthy. It enhances the texture of the skin by nourishing, replenishing, and rejuvenating it with essential nutrients as well as moisture. The antibacterial, anti-inflammatory, and antioxidant properties of the oil help in preventing acne, pimples, blackheads, etc. ‘Kumkum’ (Kesar or saffron) illuminates the skin naturally by improving the skin tone and brightening up the complexion. The presence of Kesar also makes the oil a natural sunscreen and its anti-solar effects provide protection against harmful UV rays. It also contains Turmeric and Chandan that lighten the skin while treating undereye dark circles and ugly suntans. Antioxidants in the oil keep wrinkles, fine lines, age spots, etc. away by slowing down the aging. Yashtimadhu makes the oil great for treating spots, marks, blemishes, hyperpigmentation, and scars. Chandan, Ushira, and Bael have amazing cooling and soothing qualities, which keep sunburns, inflammation, oiliness, etc. at bay. Cleanse both your skin as well as your hands with a mild cleanser. Pour 4-5 drops of Kumkumadi oil onto your palm and apply it all over your skin in a thin layer. Massage with your fingertips for at least 5-10 minutes by following gentle and upward strokes. This will help the oil gets absorbed into your skin completely. You can wipe off the excess oil with a damp washcloth after the application. If you have dry skin, let the oil sit on your skin for 3 hours or more. For oily skin, it can be kept for an hour before washing off with lukewarm water. An overnight application of Kumkumadi oil is recommended for treating specific skin issues. What is the price of Kumkumadi oil? The price of Kumkumadi Oil varies based on product, brand and ingredients. Typically a 100 ml product will cost you $5 – $7. Is Kumkumadi Tailam good for pigmentation? Kumkumadi oil consists of yashtimadhu which makes the oil great for treating spots, marks, blemishes, hyperpigmentation, and scars. Can we apply Kumkumadi Tailam on face? Yes, It can be directly applied to skin. It has antibacterial, anti-inflammatory, and antioxidant properties. Being an Ayurvedic oil, it has no side-effects.